What conditions does Soma treat? Tell your doctor right away if you have any serious side effects, including: confusion. List Soma side effects by likelihood and severity. Before using this medication, tell your doctor or pharmacist your medical history, especially of: a certain blood disorder (acute intermittent porphyria), kidney disease, liver disease, seizure, personal or family history of a substance use disorder (such as overuse of or addiction to drugs/alcohol). This medication is not recommended for use during the first 3 months of pregnancy. It may harm an unborn baby. During the last 6 months of pregnancy, this medication should be used only when clearly needed. Discuss the risks and benefits with your doctor. What should I know regarding pregnancy, nursing and administering Soma to children or the elderly? Tell your doctor or pharmacist if you are taking other products that cause drowsiness such as opioid pain or cough relievers (such as codeine, hydrocodone), alcohol, marijuana, drugs for sleep or anxiety (such as alprazolam, lorazepam, zolpidem), other muscle relaxants (such as cyclobenzaprine, methocarbamol), or antihistamines (such as cetirizine, diphenhydramine). Does Soma interact with other medications? 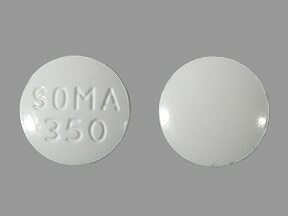 This medicine is a white, round, tablet imprinted with "SOMA 350". 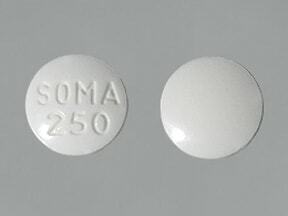 This medicine is a white, round, tablet imprinted with "SOMA 250". 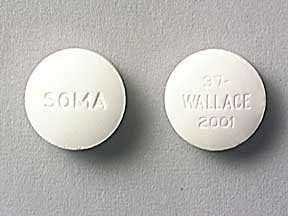 This medicine is a white, round, tablet imprinted with "SOMA" and "37 WALLACE 2001". Are you considering switching to Soma?